"There's a compromise in everything," says interior designer Sonya Randell. camera (Lena Mirisola) Johnny Earle and Katie Freketic pose in their newly-designed bedroom. Sometimes with couples, deciding to move in together is the easy part. The hard part comes when it is time to decorate your new abode and blend sometimes completely different styles. Johnny Earle and Katie Freketic faced that dilemma after getting married nearly three years ago. (Lena Mirisola) Johnny Earle and Katie Freketic pose in their newly-designed bedroom. It was their design differences -- bold and graphic for him, clean and simple for her –- that left their master bedroom in their Wellesley, Mass. home with plain walls and little furniture. 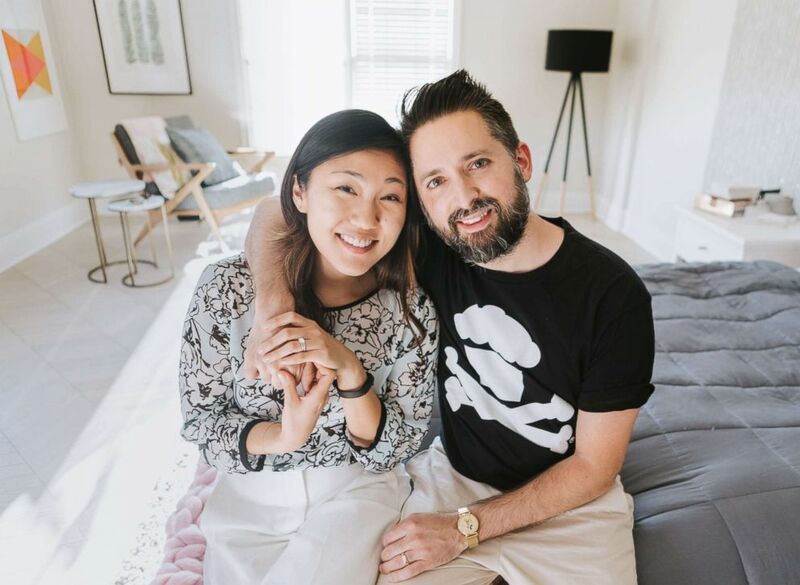 (Courtesy Homepolish) Johnny Earle and Katie Freketic faced a design dilemma with their bedroom. The couple turned to an interior designer for help in blending their different styles. The designer who helped Earle and Freketic turn their room from drab to a blend of their two styles said their experience is not uncommon. “Couples know what they both like but they don’t know how to put it together,” said Sonya Randell, a Boston and New York City-based designer who Earle and Freketic found through Homepolish, a business that matches clients with interior designers and contractors. "There's a compromise in everything." Randell's first strategy with Earle and Freketic was to talk to them together, as a couple, to see where their differences lie and what similarities she could find. Whether you have professional design help or not, Randell said the first step is simply asking a lot of questions in order to figure out what you really want from the room. "My strategy is I like to create spaces that fit people," she said. "I want to see spaces that reflect the people who live in them." Randell says these five steps can help couples navigate designing their shared space with peace. Use an online tool like Pinterest or save pictures of designs you like in books and magazines to start a design profile. "Expose yourself to different images and put the ones on your board that you’re drawn to the most, without even thinking about it," Randell said. "You’ll notice there are repeating features, like plants or softer tones or patterns." (Pinterest via Homepolish) Designer Sonya Randell recommends using a tool like Pinterest to create a design mood board. Then you can look for the common design elements and focus on those, advises Randell. "Generally, couples have something in common or they wouldn’t be together," she said. "Look for commonalities, like you both like furniture made out of wood." 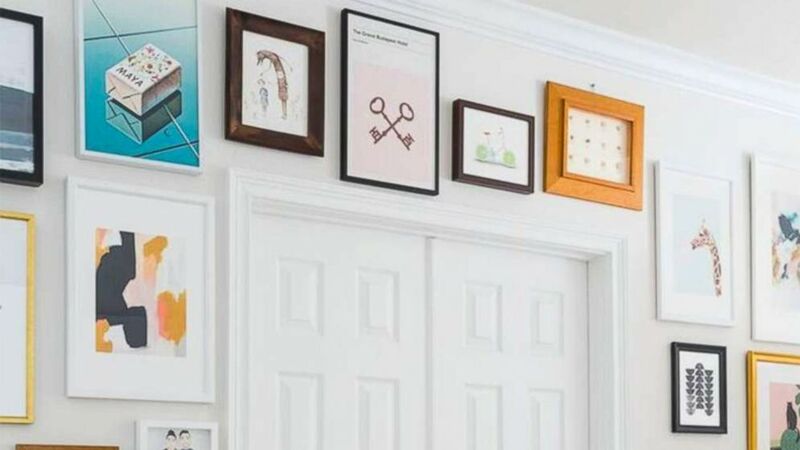 Before you put down stakes on how the space will be decorated, figure out together how you want the space to be used and who will use it the most often. "Function is first and everything steamrolls off of that," Randell said. "Make sure it’s functioning in a way that makes you both feel good." If there’s one area that’s more important to one person, prioritize the design of the person who uses the space the most, if possible, advises Randell. In Earle and Freketic's bedroom, Randell prioritized Freketic's more relaxing, Scandinavian style because the main function of the bedroom is sleep and relaxation. (Courtesy Homepolish) Johnny Earle and Katie Freketic combined their design styles in their bedroom. Earle and Freketic learned by experience that they needed patience when decorating their bedroom together. "With our first house we were really excited to live together and we wanted to make it something special," Freketic recalled. "No one had conflict but we just went too quick and picked out things that we thought would go together and then ended up with a mess." 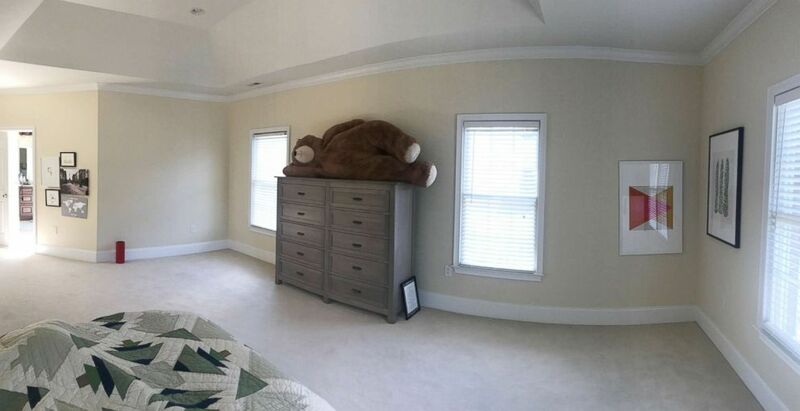 With Randell as their designer, the process for designing just their master bedroom alone took a few months. "Pick out all of the pieces together before purchasing anything," Randell advises. "Don’t pick out anything until you’ve thought through the space as a whole." Design differences among couples can become even more stressful if they are also not aligned on the cost of the design, according to Randell. 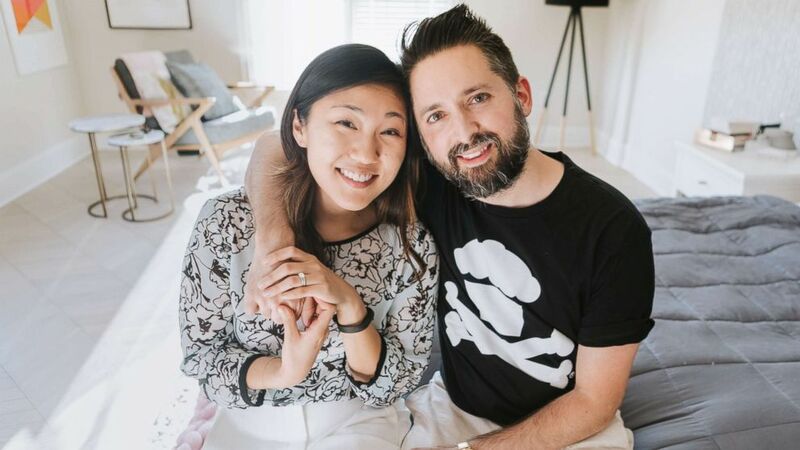 "The first step of a couple entering into this is getting a general idea of budget and both feeling good about it," she said. "Have that conversation about the budget first." Budgeting also helps couples identify their priorities and the areas in which they want to invest money. "You may want to invest in a bed because that’s important or a sofa because you're a family and you spend a lot of family time there," Randell said. "If a partner cooks a lot, maybe you want to invest in a more expensive stove too." She added, "That’s always a worthwhile exercise because partners can get more on board with the financial investments." Earle and Freketic chose a light pink color that they both liked as a common theme in their bedroom. While the room's main design is the softer tone preferred by Freketic that matches the room's functionality, elements of Earle's bolder aesthetic are incorporated too. Bold artwork surrounds the room's entrance and Mid-century furniture, favored by Earle, is featured in the room too. 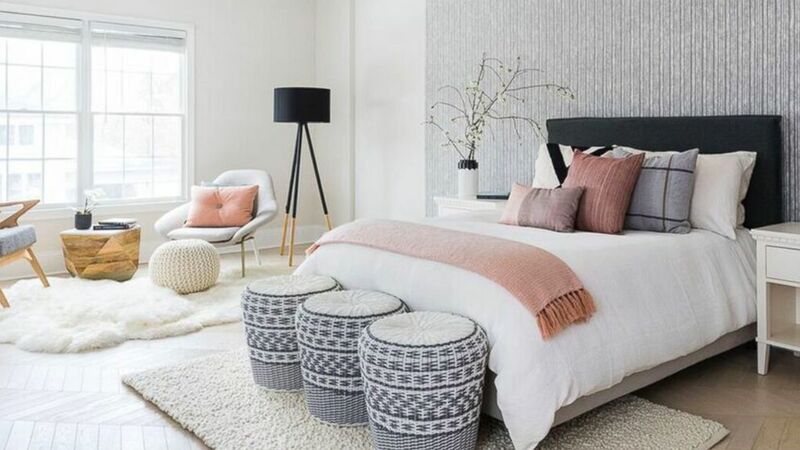 (Courtesy Homepolish) Johnny Earle and Katie Freketic's bedroom is pictured after its redesign. "I always recommend fusing designs," said Randell. "The reality is you can translate a space into a million different aesthetics and they’ll all look good. The answer is finding what works best for you."